Scotland is well-connected to the rest of the world thanks to the wide network of Scottish airports that serve both international and domestic travellers. Not only are the main cities catered for with international travel hubs but there are also several smaller towns on the outskirts of the country that have airports linking the mainland to the islands to the west and the north. Edinburgh airport is the busiest airport in Scotland. Glasgow international airport takes the title of Scotland’s second busiest. Glasgow airport opened in 1966 but its history goes back to 1932 when it was used by the RAF. Inverness airport was originally built as a military installation in 1940. The old airport at Dyce was the location for a secret wartime event when a German plane landed there due to its crew wanting to defect to the Allied side. The main runway at Edinburgh airport is 2560 metres long. The landing strip at RAF Stornoway is featured in the Tom Clancy novel “Red Storm Rising” as a base for the Allied air operations over the North Atlantic. Over 30 different airlines operate out of Glasgow airport travelling to over 100 destinations. The beach landing strip at Barra airport handles over 1000 incoming and departing flights each year. At the height of the oil industry over 500,000 passengers travelled from Dyce airport by helicopter each year. There are plenty of options for you to choose from when deciding to fly to or from a Scottish airport and the following guide to the main Scottish airports will give you all the information you need to find out which one is the ideal airport for you. Edinburgh Airport lies 5 miles to the west of Edinburgh and is the third biggest airport in the UK in terms of passenger numbers. It is also one of the best Scottish airports for customer shopping and dining experiences. Travel to the airport from inside the city is easy and visitors can use bus, tram, car and taxi services. Subject to the time of day, the average journey takes around 30 – 40 minutes. A regular airport bus is operated by Airlink 100 and runs every 10 minutes, 24 hours a day from Waverley Bridge (the central train station in Edinburgh city centre). Tickets can be bought at the airport information desk, at the bus stop, from the driver, or online. Full airport bus details are available to view at the Edinburgh Airport website bus and coaches page. Alternatively, visitors can take a tram ride to the city centre which takes around 40 minutes. 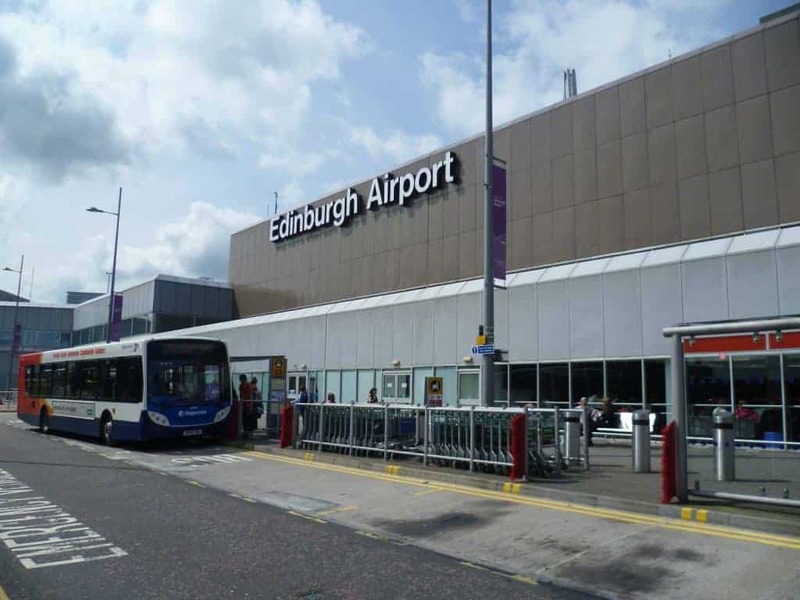 For further information about travellers arriving and departing from Edinburgh Airport please visit The Edinburgh Airport Guide. Glasgow airport is an international travel hub with around 30 airlines serving over 120 destinations worldwide, including Canada, the US, the Caribbean, Europe and the Gulf. Glasgow is Scotland’s principal long-haul airport as well as Scotland’s largest charter hub. Carrying over nine million passengers per year, Glasgow Airport serves more Scottish destinations than any other airport and is a key component of Scotland’s transport infrastructure. There are regular bus links from the city centre to the airport as well as dedicated taxi ranks at the airport exit/entrance. If taking the bus then the First Glasgow Airport Express service 500 also connects you directly to the airport from Queen Street in Glasgow City Centre and Glasgow Central Train Stations. When driving your own car exit the M8 at Junction 28 if you’re travelling from the east, or Junction 29 if you’re travelling from the west. The airport has a dedicated drop-off/pick-up facility located directly across from the main check-in hall. If you want to take the train to the airport from the city centre, the nearest station is Paisley Gilmour Street – just over one mile from the terminal. From there you can take the McGill’s 757 bus service direct to the airport departure building. Glasgow Prestwick is an international airport serving the west of Scotland and is situated about 32 miles from Glasgow city centre and around 1 mile from the South Ayrshire town of Prestwick. Although Glasgow Prestwick is the fifth-largest airport in Scotland it still accommodates over 2 million passengers annually. Prestwick airport is the only airport in Scotland to have its own railway station, and services run 4 times per day during day-time hours Monday to Saturday, with connections to Glasgow Central Station and Edinburgh Waverley Station. Busses to Prestwick airport are operated by Stagecoach Western with services connecting the airport to Glasgow and Ayr. This Scottish airport also runs its own shuttle bus between the terminal and long and short-term car parks. Dundee airport is located close to Dundee city centre with the journey by taxi taking around 5 minutes. The airport can be accessed from the A85 ring road as well as the north and south routes of the A90. The airport has a car drop off zone as well as a car park which is roughly a 5-minute walk to the terminal. The airport terminal is open Monday to Friday 05:45 to 21:00, Saturday 08:00 to 17:00, and Sunday 09:00 to 21:00. The terminal has toilet facilities, a cafe, drinks and food machines and internet facilities. Dundee city centre is served by rail with passengers able to take advantage of taxi ranks outside Dundee station for the 5-minute drive to the airport. The 2 main taxi firms are Tele Taxis (Tel. 01382 669 333), and 50 50 50 Taxis (Tel. 01382 505050). Aberdeen International Airport is located about 6 miles northwest of Aberdeen city centre. Around 3 million passengers use the airport annually with a significant proportion being offshore workers in the oil and gas industry. The airport has excellent facilities for travellers with a selection of restaurants, bar, lounge, internet and shopping facilities on offer. Carriers including KLM, Flybe, Easyjet and Loganair operate out of Aberdeen on routes predominantly throughout Europe. For passengers wishing to stay overnight, there are hotels close by including Jurys Inn, Premier Inn and Holiday Inn all within a few minutes drive from the main terminal. Aberdeen is well served by the Aberdeen International Airport at Dyce which has frequent bus and taxi links to take you into the city centre or anywhere else, although the road network around Aberdeen is often extremely congested so your journey will undoubtedly take longer at peak times. Please view the Aberdeen Airport website for details of flight times and facilities. The airport is served by bus from the city by the First Bus Aberdeen network with a dedicated No.727 bus running every 10 minutes from the main bus and rail stations in the city. The nearest rail station is around 3 miles away at Dyce Station, where passengers will find a taxi rank in the station car park. Inverness is an international airport situated at Dalcross, around 8 miles from the centre of Inverness. This airport is the main gateway for travellers to the north of Scotland and the outlying islands with services also running between continental Europe and throughout the UK. Around 875,000 travellers use Inverness airport each year with many using the business links to London Gatwick and London Stanstead, while domestic passengers can take advantage of the links to the north-island airports at Sumburgh and Kirkwall. Access to the airport by road is possible by the Inverness Airport Way from the A96, and a taxi rank is available directly in front of the terminal building. Bus services operate between the airport and Inverness, Nairn and Elgin, with the Stagecoach service Jet Bus running between the airport and Inverness centre every 20 minutes at peak times. Wick John O’ Groats Airport lies approximately one mile north of the town of Wick in Caithness at the far north of Scotland where it offers scheduled services to Aberdeen and Edinburgh, as well as commercial helicopter flights to offshore oil and gas installations. This is one of the smallest of the main Scottish airports but it’s still fairly heavily used by commuters as it’s also used as a stop-over point for light aircraft travelling between Europe and North America via Iceland. The Scottish carrier Loganair operates out of Wick with a daily service to Edinburgh alongside the budget airline Flybe with its twice-daily link to Aberdeen. Kirkwall is one of the main Scottish airports serving the north-Scotland island of Orkney and is located around 3 miles southeast of the town of Kirkwall. The primary airline is the Scottish carrier Loganair which operates routes to Aberdeen, Edinburgh, Inverness and Glasgow as well as providing air links between several smaller island airports. Kirkwall is the main town on Orkney which makes it a great base for touring the islands, with many tourists preferring the convenience of taking a flight to taking a ferry between the islands of the Orkney archipelago. If you use Kirkwall airport consider booking the flight between the islands of Westray and Papa Westray, as this route has the honour of being officially the world’s shortest scheduled flight at only two minutes duration! The terminal is open Monday to Friday 06:15 to 19:45, Saturday 06:15 to 17:30, and Sunday 09:00 to 19:45. Inside the terminal, you will find a cafe serving hot and cold drinks, a licensed bar, TV, pay phones, toilets and WiFi facilities. The Shetland Islands are a popular destination for tourists thanks to the island’s 1600 miles of unspoilt coastline and traces of human civilisation which date back over 6000 years. Sumburgh is the main airport serving the Shetland Islands and is situated around 20 miles south of Lerwick. The main operator from Sumburgh is Loganair which runs services to Aberdeen, Edinburgh, Glasgow, Inverness, Kirkwall and Manchester, and there are also seasonal flights to Bergen in Norway. The airport has a cafe serving hot and cold drinks and light snacks, as well as a shop selling newspapers and toiletries. The terminal occasionally has taxis waiting outside the main building though it would be wise to book in advance with one of the main taxi companies before you depart. Phone Boddam Cabs (01950 460 111), J & I Taxis (01950 422 2017), Allied Taxis (01595 690 069), or Sinclair’s Taxis (01595 696060). There is also a regular airport bus service that takes passengers to Lerwick in about 40 minutes. Campbeltown Airport is situated near the tip of the Kintyre peninsula in Argyl and Bute, around 3.5 miles west of the town of Campbeltown. This small airport serves as an air link between the peninsula and Glasgow with twice-daily flights operated by Loganair. Car parking at this small airport is free of charge and taxis can be booked either in advance or direct from the airport terminal. Phone Fona Taxis (01586 554 001), Roy’s Taxis (01586 554 625), or Tavi’s Taxis (01586 55 11 22). Payphones are available inside the terminal building. If you wish to fly to Oban you can take the daily flights from Glasgow airport which land at this airport located 5 miles outside of Oban town centre. Oban is one of the main Scottish airports that serve the islands of Coll, Tiree, Islay and Colonsay so it’s perfect if you want to head out to the western islands. Currently, Hebridean Air Services is the only airline based at Oban, with two routes running between Colonsay, Islay, Coll and Tiree. If you want a car after arriving at the airport there are several local companies which offer car rentals, or you can use one of the local taxi services which also pick up from the airport. Mon & Wed: 08:15 – 16:15. Tue & Thu: 08:15 – 17:15. Sat & Sun:L 10:00 – 17:15. Mon & Wed: 08:15 – 16:00. Tue & Thu: 08:15 – 16:15. Fri & Sun: 10:15 – 16:15. Islay Airport is located 5 miles northwest of the town of Port Ellen and is operated by Highlands and Islands Airports Ltd with services running between Islay and Colonsay, Oban and Glasgow. Islay, known as the ‘Queen of the Hebrides’, is becoming increasingly popular with tourists who want to visit the island’s many whisky distilleries, and the regular route from Glasgow is often booked months in advance. The terminal has a cafe serving hold and cold drinks and light snacks and there are also toilets and pay phones in the main building. The terminal opening hours are Monday to Friday 09:00 to 18:25, Saturday 09:00 to 10:10, and Sunday 15:00 to 16:00. Car parking is free of charge with the small car park located adjacent to the main terminal building. Taxis can be booked in advance or direct from the terminal building. Phone Bruichladdich Taxis (01496 850271), Fiona’s Taxis (01496 301622), or Lamont’s Taxis (01496 810449). Public transport to and from the terminal is covered by a bus service that runs to all towns on the island, although there might not be an available service depending on the time of year. Bus timetables can be found at the terminal information desk. As the most westerly island in the Inner Hebrides, Tiree has grown in popularity due to the waves brought in from the Atlantic Ocean which has made it something of a Mecca for windsurfers. Flights to Tiree are therefore often fully booked well in advance, especially in October when the island hosts the Tiree Wave Classic windsurfing event. Tiree airport lies 3 miles northeast of the village of Balemartine and is arguably the smallest of the main Scotland airports. This small airport has a scheduled service running to and from Glasgow operated by Scottish airline Loganair while Hebridean Air Services operates flights to and from the islands of Coll and the mainland town of Oban. The terminal on Tiree has free parking and taxis can be booked in advance through John Kennedy Taxis (01879 220 419). There is a snack machine inside the terminal building as well as an information desk. Terminal opening hours are Monday to Saturday 09:30 to 18:00 and Sunday 15:00 to 16:15. The busy town of Stornoway is the ideal location to explore the islands of Harris and Lewis and as the airport is only a 10-minute drive away it’s perfect for catching a flight for an island weekend break. Stornoway Airport is situated on the Hebridean Isle of Lewis approximately 2 miles east of the town of Stornoway. The two airlines that operate from the airport are Flybe and Loganair, with the former operating routes to Aberdeen and the latter to Benbecula, Edinburgh, Glasgow, Inverness and Manchester. The terminal has a cafe serving hold and cold drinks, snacks and light meals and there’s a small shop selling newspapers and toiletries. Other facilities include pay phones, WiFi, toilets and a waiting area with TV. Opening hours for the terminal are Monday to Friday 06:30 to 19:45, Saturday 06:30 to 15:00 and Sunday 11:30 to 18:15. Short and long-term parking is provided adjacent to the main terminal building with a day rate of £3. See their website for further details. Taxi providers operate from outside the terminal building although you should book in advance to ensure a taxi is available. Phone Alec’s Taxis (01851 871038), Alpha Taxis (07553 374210), A1 Taxis (07818 216970), or others as advertised in the information booth inside the terminal building. Public transport is covered by a bus service that runs regularly throughout the day from the airport to Stornoway town centre. 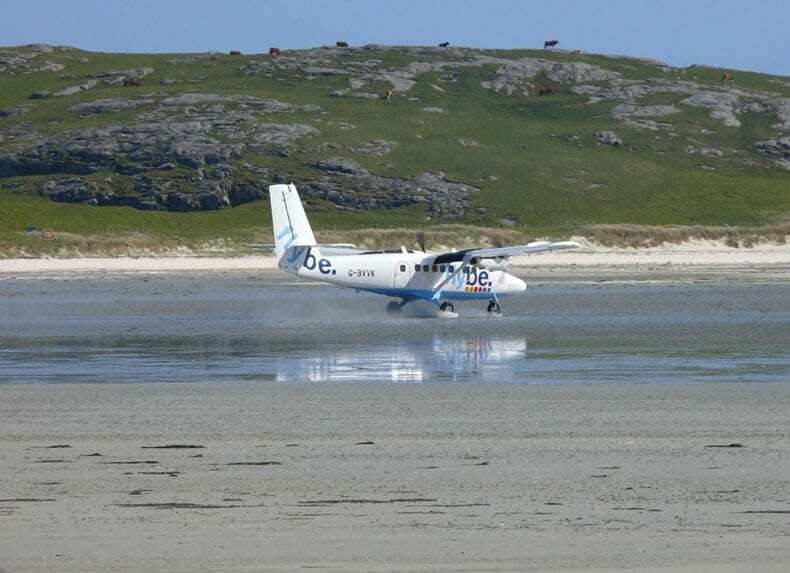 The small Scottish airport at Barra is famous for being the only airport in the world to have its runway on a beach, which is actually located in the wide shallow bay of Traigh Mhor at the northernmost tip of the island. At high tide, the three runways on the beach are under the sea so flight times vary with the changing tides. Twice-daily flights to and from Glasgow are scheduled via the airline Loganair. Terminal opening hours are Monday to Saturday 10:30 to 15:30 and Sunday 11:30 to 12:45. Car parking is free of charge and the car park can be found adjacent to the main terminal building, while taxis can be booked in advance from one of several firms advertised inside the terminal. Phone Barra Taxi (01871 810012), Campbell Taxi (01871 810216), or Dans Taxi (01871 810497). There is a bus service that runs from Barra airport to the village of Castlebay – see the latest timetable inside the terminal for details. Benbecula Airport is located on the Outer Hebridean island of Benbecula where it aims to serve islanders with regular routes to Edinburgh, Glasgow, Inverness and Stornoway. The airport is managed by Highlands and Islands Airports Ltd while flights are operated by the airline Loganair. The terminal, while small, has a cafe and payphones, and there is free car parking available in the car park adjacent to the terminal building. Car hire can be arranged through Car Hire Hebrides while taxis can be booked in advance or called directly from the terminal. Phone Buchanans Taxis (01870 602 277) or MacVicar’s Taxis (01870 603 197). Public transport is served by a regular bus route which runs from the airport to various destinations throughout Benbecula and the islands of North and South Uist. I hope this guide to the main Scottish airports has been of some use to you, and I’ll endeavour to keep it up to date where possible, but if you notice any errors please contact me so I can correct them. Thanks for reading, and happy travelling!